For my project management followers, I apologize for the off topic post. 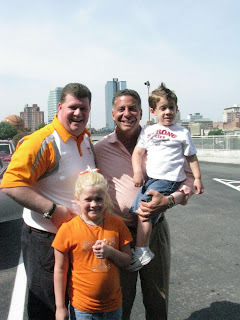 The news abounds today about the firing of Bruce Pearl, Head Basketball Coach, University of Tennessee. I believe that more and more stories will come out as to what happened and different allegations. While I don't condone the NCAA infractions and the misleading that Bruce has already admitted to, I definitely do not condone bringing this story out before our first game in the NCAA tournament. That is too much pressure to put on college kids already under tremendous pressure. I do not know all of the facts about the case, but I do think that Bruce leaving hurts the University of Tennessee. There are many critics, but what he has done to bring energy to the program is without question or equal. I think Tennessee basketball will be setback several years as a result. With all of that said, I wanted to share what type of person that I think Bruce was and it is illustrated with a simple picture. I had just finished doing some consulting for UT and taken my family to the Tennessee vs. UCLA game. On Sunday, as we were leaving the hotel, I saw Bruce outside. I had asked my wife Stephanie to get the camera. She couldn't find it. She searched and searched the bags. When she told me she had found the camera, I turned to ask Coach for a picture. By that time, he had gotten into his car, started it, and was about to leave. I said, "Hey Coach" and turned to see him in his car. I quickly turned back around thinking that we had missed the opportunity. Coach Pearl turned off his car and opened the door and shouted, "Did you want a picture?" I said that I did. He got out of the car and then graciously took a picture with me and my children. For me, that told me all that I needed to know about Coach Pearl. He was a man of the fans. He understood that his role was more than coach, it was also ambassador. Painting his chest, rapping at a concert, and the genuine excitement that he had for Tennessee Basketball will be hard to match. Most coaches that come in already have to coach under the shadow of the great Pat Summitt. Now, they have to work under the shadow of Coach Pearl as well. Coach Pearl has such a large heart and passion and it shows. His team loves him and it shows. He loved the University of Tennessee and it shows. I am sure that Tennessee had cause. Coach Pearl has already admitted that he had done wrong. I wish that both sides could have worked it out. Some of our greatest icons in sports had to overcome being human. Could we not have embraced and nurtured to overcome this one? Coach Pearl has done wrong and should shoulder the consequences. Being suspended 8 games, docked $1.5 million, and publicly humiliated out to be enough. To Coach Pearl, good luck to you and you will be sorely missed by the Vol Nation.